MUFF WIGGLER :: View topic - CV Mixer vs VCA? Hello everybody, this is my first Post in this forum - and suprise! - its a noob question. I am wondering, what the difference between a VCA and a CV Mixer is. I understand, that a VCA allows you to process audio, which a CV Mixer doesnt (although i dont know where the difference is between a CV mixer and a Audio Mixer), but when I use a Vca to modulate Control Voltage with other Control Voltage ( for example one Lfo modding the other), where is the difference to Mixing these 2 CV signals in a CV mixer? They're the same. A CV mixer is just multiple VCAs summed together. Maybe someone will explain this better than me, but I'll give it a shot anyway! With a VCA you're controlling the amount of X by Y. Think of it as multiplication. In most VCAs, the value of Y is clamped to 0V, so you get amount of X multiplied by 0 - upper limit, making the amount of X more or less. Also the output would never be more than X (unless it's a real amplifier too, usually VCAs are voltage controlled attenuators). (There are "through-zero" VCAs as well, like the Moddemix, where Y can go into negative territory as well. With audio rate values of X and Y you get into amplitude and ring modulation territory). With a mixer, you're adding the values of X & Y. So when Y == 0, nothing happens to X, the output is the value of X, whereas in a VCA, Y == 0 would make X not pass through at all. The only way to cancel out X with Y would be possible when Y == an inverted version of X.
Thabk you very much, good answer! So, can you open a mixer’s level vca with an envelope? If I plug my oscillators straight into a sub mixer with level vca, in my case the Verbos Scan & Pan, and envelopes into said vca, I can bypass a separate vca and just use those on the mixer? Still a noob asking noob questions, hopefully for the benefit of other noobs. I'm not familiar with the Scan and Pan but theoretically, yes - if it's a multi channel VCA with a mixing function, you can most certainly do that. The mixing level can be either attenuating the incoming envelop OR attenuating the output signal of the relevant channel before going into the mix bus, however, so you might want to see how that affects the VCA or mixing function, it probably doesn't in any significant way but still good to know. if the mixer has CV control over the VCA, absolutely, that's the point. Scan and Pan can do this, definitely. That's a pretty fancy module for such a task, since the panning of the VCAs is part of the baked in price, but certainly. The Befaco Hexmix VCA is a less expensive, similar moldule if you don't need the panning (or the scanning). Scan and Pan is awesome though, if you understand how it works. 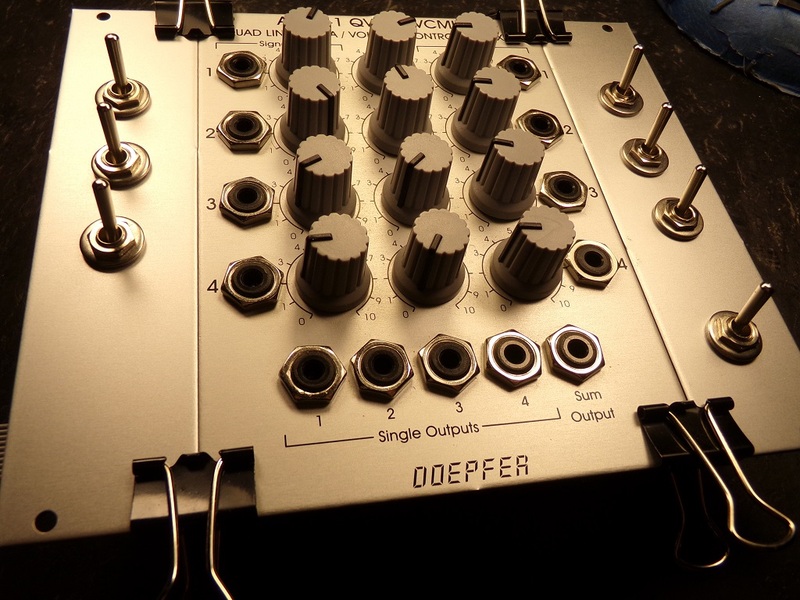 I have four Doepfer A-135-1 Quad VCA/CV Mixers. They're well spent money. Through the use of jumper links on the circuit board you can set the A-135-1 up so that if you tap one of the four VCA outputs that VCA is removed from the summed output. Through the use of the very same jumper links you may also set the A-135-1 up so if you use one of the VCA's individual outputs that signal is still included in the summed output. I went one step further, and replaced all of the jumper links with toggle switches. Another jumper option is that the A-135-1 inputs are set up from the factory to be normalled together. That means if you plug some sort of signal into Channel 1, that signal is normalled to the other three channel inputs. In that configuration the A-135-1 becomes a voltage controlled 4 channel distributor. Same thing with the CV inputs for all four channels. Insert a control signal into Channel 1 CV in, and that same control signal is normalled to all 4 channels. Both the signal inputs and the CV input normalled connections are broken when anything is inserted into any of the other channels. I did the same thing with those jumper links that I did with the input configuration jumpers .... replaced them with toggle switches. 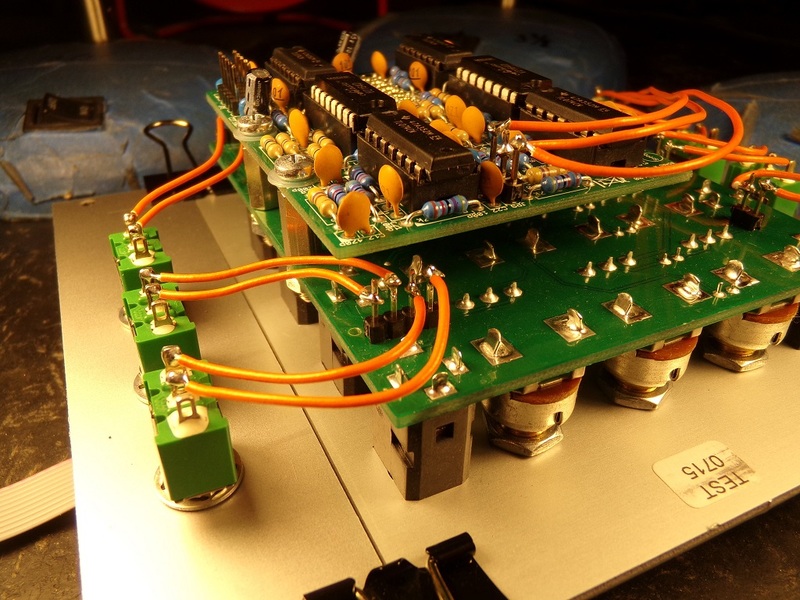 I've only modified one of the four A-135-1 Quad VCA/Voltage Controlled Mixers in that manner (so far!). I find that module to be highly useful and one of Doepfer's better utility modules. Doepfer also offers a quadrature LFO that is quite useful with the A-135-1, as well as a "morphing LFO" that works especially well with the A-135-1. The Doepfer A-135-1 is a very well spent $190.00. 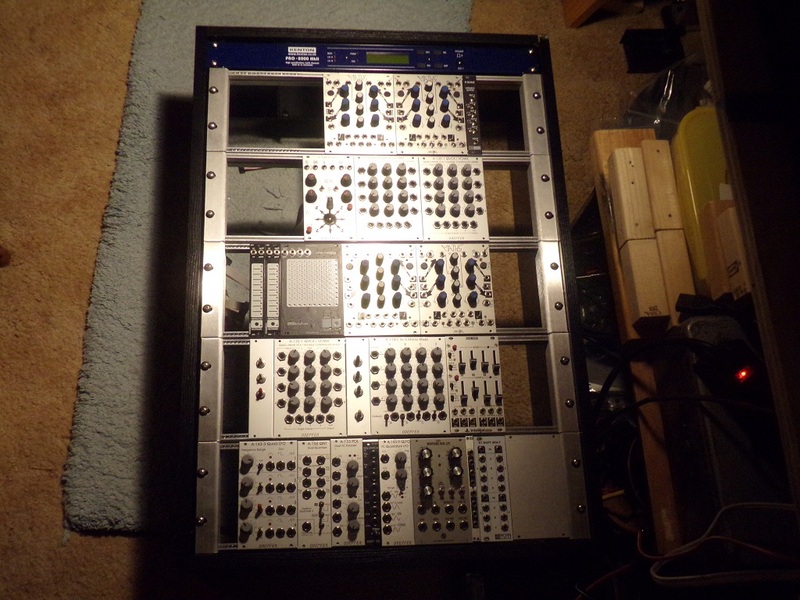 Those four A-135-1 modules work well with the four Make Noise "MATHS 2013" modulators in my modulation cabinet that is used exclusively for modulating my 5U modular synth. The 5U modular has no modulation circuits, it's specifically designed for use as audio signal chain production only. 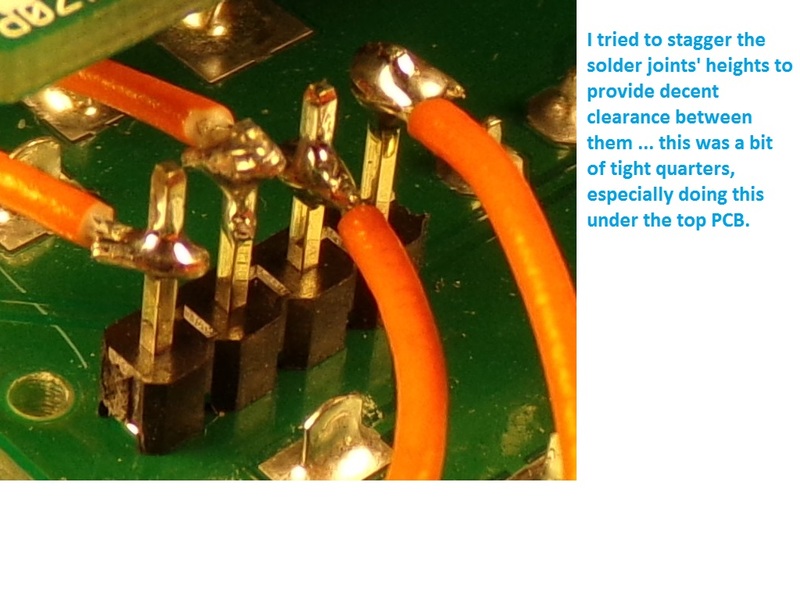 Any reason you didn't use MTA connectors on the PCB to avoid joint staggering? I am wondering, what the difference between a VCA and a CV Mixer is. CV Mixer or VC Mixer? You have confused some people. Most VCAs will process inputs down to DC. If they are part of a VC Mixer then they are more likely to be AC coupled. but when I use a Vca to modulate Control Voltage with other Control Voltage ( for example one Lfo modding the other), where is the difference to Mixing these 2 CV signals in a CV mixer? Synthesizer VCAs are usually maximum level or unity gain at the most positive CV and maximum attenuation at the most negative CV. So, say, +5V = 0dB or 100% and 0V = -100dB or off. (This is the opposite of VCAs used in automated professional mixers where 0V = 0dB and +5V = off.) To get a synthesizer VCA to add you have to put the manual gain on maximum and use negative CVs. E.g. if the manual knob clockwise is 0dB and the law is 20 dB/V a CV of -1V is -20dB and two added CVs of -1V is -40dB which is the same as two VCAs in series with -1V on each. However if the VCAs are linear with 0-5V control and again set to 100% manually then a CV of -1V is 80% (-1.9dB) and -2V is 60% (-4.4dB) whereas two VCAs in series is 80% x 80% = 64% (-3.9dB). If the CVs were -2.5V the attenuation would be 50% (-6dB), but adding CVs gives 0% (-infinitydB) and two VCAs in series is 25% (-12dB). It is only the same with exponential VCAs because adding exponents is the same as multiplication. In short, it's different with linear VCAs. In practise a lot of VCAs don't go fully off and there may be some bleed so two VCAs in series is more likely to be quieter when you want off. Didn't have any, and didn't want to mess with figuring out which connectors it would take, ordering them, waiting on them to come in, then having to fiddledick with putting wires on them. So I figured ~screw it~ and just soldered wires to the pins. the new version of the a-135-1 is able to process also slowly varying control voltages because the signal in/outputs are dc coupled. 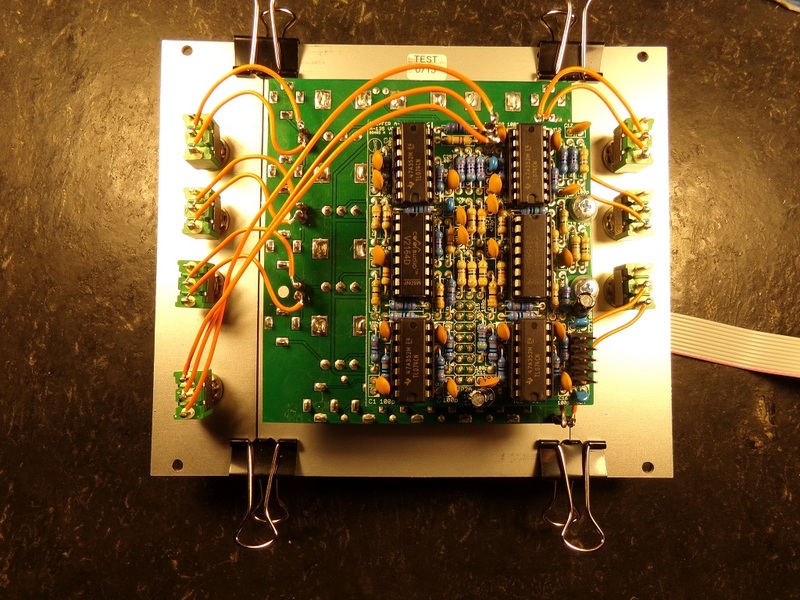 it has in addition four single outputs available and can be used as four independent linear vcas. the new version is manufactured since may 2013 and can be identified by the additional four single outputs, the 18 hp front panel width and the vca circuits (ssm2164 or v2164)"
The four that I have are all "new version" designs.